In last Sunday's Herald-Leader, Cheryl Truman, with the help of many readers, listed 50 things that define Lexington. We thought it would be fun to make a similar HerKentucky list, with 10 things that define our respective hometowns. Today, we're talking Floyd County, my Eastern Kentucky homeland. Coal in my parents' backyard. 1. Jenny Wiley Theatre: A unique outdoor theater located in Prestonsburg's Jenny Wiley State Park. While the summer stock theater crowd pads their resumes, Eastern Kentuckians enjoy high-quality productions. I've seen more revivals of Annie, Grease, and Steel Magnolias than I can count, along with the signature Jenny Wiley Story. 2. Billy Ray's: Originally a pool room, Billy Ray's has evolved over the years into Prestonsburg's favorite diner. The decor serves as a museum of Floyd County history, commemorating elections, the historical landscape, and the tragic 1950s school bus crash. Billy Ray's hamburgers are THE quintessential Floyd County food. 3. Route 23: The Country MusicHighway. The Road to theNorth. It's also the main highway through Floyd County. 4. Coal: Energy source,political bellwether, source of the local economy. Coal is everywhere in Floyd County, and we all have some pretty intense feelings about it. 5. "The New Martin": A few years ago, the town of Martin was slated to be moved from within the flood plain. And then it wasn't. The old town remains. 6. Jenny Wiley State Park: The Boat Dock, the Golf Course, Dewey Dam -- the park holds so many memories for everybody who's ever lived in Floyd County. 7. Stonecrest Golf Course: It's located on top of a mountain. You can't get any more Floyd County than that. Floyd County's public school system is the county's largest employer. 9. Basketball: We love us some basketball in Floyd County. We follow our high school teams. We follow our grade school teams. We obsess about our beloved Kentucky Wildcats every day of the year. The School's been closed for 20 years, but Wayland is home of the Wasps. 10. Lizzie B's: Although it's only been open for about a year, Lizzie B's has transformed the landscape of Floyd County dining. You can get a craft beer or a glass of wine with dinner. You can get a sandwich garnished with avocado and sprouts! Revolutionary stuff that I never expected to see in Floyd County. In "60 things", "billy ray's", "coal", "eastern kentucky", "floyd county", "jenny wiley state park", "lizzie b's", "martin", "prestonsburg", "route 23", "wayland"
In last Sunday's Herald-Leader, Cheryl Truman, with the help of many readers, listed 50 things that define Lexington. We thought it would be fun to make a similar HerKentucky list, with 10 things that define our respective hometowns. Today, Emily shares her take on 10 things that define Lexington. In choosing things to include on my list of 10 things that define Lexington, I opted to go for things that are top-of-mind for me right now. There is a lot of history (and I'll fully admit I know very little of it) behind lots of places in Lexington, and were covered well in Cheryl Truman's Herald-Leader piece. I'm just sticking with what I know (and love) about my city. 2. The seasons. Also related to today's drive along the interstate is the seasons. Lexington has all four seasons, but without too many extremes. We get bright, warm summers but without the humidity of our friends further south. We get fall and these AMAZING colors all around on the trees. If you squint your eyes, the colors seem as vibrant as they are in a crayon box. Winter brings enough snow to build snowmen and go sledding a couple of times, but not so much that it shuts down the city (usually). Spring brings with it some rainy days, but also delivers pastel-colored blooms that will snap your winter blues. As seen on my drive down I-75 today. 3/4. Coffee Times Coffee House/Street Scene. These two are lumped together because they are right next to each other and you can't possibly go to one without going to the other. In high school, Coffee Times was my favorite hangout spot, where I could act all cool because I was drinking coffee and being all philosophical (ha!). These days, I go there to meet with friends to have brainstorming sessions, and use it as my second office if I need to get out of the house. Also, if I ever need a funny greeting card, this is where I go first. Street Scene is a vintage store right next door, which has awesome items from jewelry to furniture to lighting to clothing to Toms shoes. It simply makes you happy to go there, even if you're like me and have no idea how to use vintage items in modern decor. 5. University of Kentucky football. Since hubs is a loyal UK football fan and we got married the day UK beat #1 LSU, UK football is embedded into my life. Every fall, I listen to disgruntled fans call into talk radio shows demanding for the current coach to be fired. Even during the bowl games times, you'd hear people wanting a change. It's never ending, and kind of funny. 6. University of Kentucky basketball. You can't escape it, nor do I really want to. The juggernaut of UK basketball brings energy, life, and unity to the city (although not to the state... sorry Cards fans). One look at Big Blue Madness and you'll realize that this NBA-size production is unlike anything else in college basketball. Further evidence? The ESPN All-Access Kentucky series currently running. Craziness. 7. Keeneland. Until you go yourself, you'll never understand the magic of Keeneland. Between the people watching, horse gazing, food/beverages, and pretending like you know how to bet, it's just an amazing experience that seems even better since we can only experience it in April and October. 8. Good Foods Co-Op Hot Buffet. Yes, I'm going straight for the cafe/buffet and not for the grocery-part of the store. The by-the-pound hot bar has a menu that changes daily, save for the Good Foods Kale, which is like healthy green crack. With vegetarian, vegan, and carnivore options, everyone is satisfied with this tasty stuff. On the weekends they have brunch items, of which my favorites are the chorizo burritos and the grits - always a different flavor (cheddar jalapeno, smoked gouda, basil, etc). Not so great for my waistline, but oh-so-yummy. 9. Lexington Cemetery. I've written about the cemetery before, which you can find here. Every time I enter the gates it's like I'm being transported into both history and into a secret garden. The least creepy cemetery ever! 10. The people: There are some good peeps in Lexington. Yes, there are some douchenuggets, but the awesome, honest, beautiful friends I have outnumber them by far. In "60 things", "emily", "keeneland", "lexington cemetery", "lexington"
In "60 things", "burger house", "hammonds hall", "herrington lake", "lancaster", "megan whitmer", "mom blakeman's candy", "owsley house", "peninsula golf resort"
In last Sunday's Herald-Leader, Cheryl Truman, with the help of many readers, listed 50 things that define Lexington. We thought it would be fun to make a similar HerKentucky list, with 10 things that define our respective hometowns. Up next? Sarah's list of things that define Paducah. 1. Rivers. They don't call it River City for nothing. Paducah sits at the confluence of the Tennessee and Ohio Rivers - just upstream from where the Ohio joins with the Mississippi and just downstream from where the Cumberland meets up with the Ohio. There wouldn't really be a Paducah without them. It defines industry in Paducah, with the barge business being a major employer in town. It has shaped our history, with floods being the events that mark time. It has truly shaped our town. 2. Quilts. I've covered this before. Paducah is the Quilt Capitol OF THE WORLD. The city's calendar revolves around the Quilt Show in May, when the entire town shuts down to welcome quilters from across the globe. We have a Quilt Museum, quilt shops, quilt societies. Quilts are our thing. 3. The Arts. Our official tagline is "Distinctively Creative" thanks to the strong and ever-growing artists community in Paducah. In the 1990s, the city government began offering artist real estate in our LowerTown for CHEAP (as in $1 cheap) if the artist pledged to fix up the real estate and make his or her home in Paducah. The Artist Relocation Program was a huge success (even got written up in the New York Times!) and now we have a town that truly values the arts ... not to mention a truly cool regional arts festival. 4. The Market House. The centerpiece of our downtown. The Market House originally housed the town's market. Now, it is home to the Market House Theater and Museum, as well as the Yeiser Art Center. Surrounded on both sides by cobblestone streets, it was recently named one of the Top Five Most Romantic Main Streets in the U.S.
5. Barbecue. Again, I've covered this before. We love barbecue in Western Kentucky and particularly in Paducah. I know other places have barbecue. It's just not as good as our's. 6. 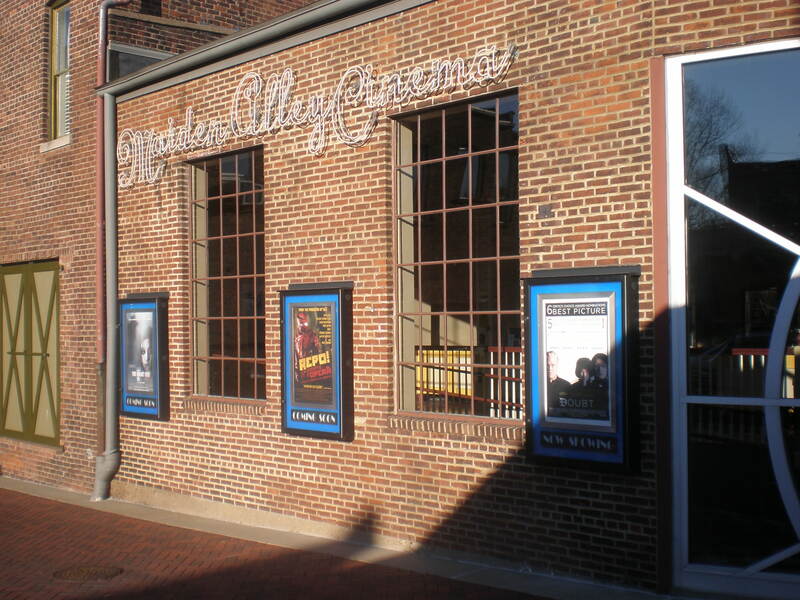 Maiden Alley Cinema. Our local non-profit art house cinema would be awesome enough on its own but it also hosts the state's second oldest film festival every fall, which gets better every year! 7. The Downtown Food Scene. We've got the only other family owned and operated Doe's (a Southern institution). We have one of the oldest and BEST bakeries in Kentucky. We also have the best seafood, Italian, and Mexican - all within a couple blocks of each other. Not to mention, every Saturday in the summers the streets are shut down to cars and fill with people, performers, and music. 8. The Lake. Kentucky Lake with all its splendor is only a half an hour away, which means it is an indelible part of most Paducahan's lives (and history). 9. Whitehaven. If you roll through Paducah on I-24 (as most people do), then you this historic mansion will welcome you from high atop a hill above one of the main exits. Built in the 1860's, it is now a welcome center and houses memorabilia from the life of one of Paducah's most famous citizens - Vice-President Alben Barkley. 10. Noble Park. 135 acres of playgrounds, ponds, and trails. I like to think of Noble Park as Paducah's own little Central Park. It is a popular place for picnics and play dates all year round but it really sparkles in December when the city lights up the entire park for the holidays. In "60 things", "lake", "maiden alley", "market house", "noble park", "ohio river", "paducah", "quilts", "whitehaven"